3. Can I buy a single shoe? 4. How do I clean my footwear? 5. The style I want is out of stock, when will you get more? 6. How can I be removed from your mailing list? 7. What styles are available in a wide width? 8. How do I write a product review? 9. What is your 30 Day Comfort Guarantee? 10. Where can I purchase styles in the Performance Collection? 11. If purchased on this site (Harley-DavidsonFootwear.com), can I return or exchange at a Harley-Davidson® Dealership? 12. How do I return or exchange Performance boots? 13. Can the boots that I bought on Harley-Davidson.com be returned on Harley-DavidsonFootwear.com? 14. How do I return or exchange my Harley-Davidson® footwear purchased on this site? 15. What is Harley-Davidson® Footwear? 16. What is Wolverine World Wide, Inc.? Please click here to view all of our current wide width shoes. In order to write a review, you must be signed in. If you haven’t already done so, please create a user account on our page. When you are all signed in, you will see "Write a Review" to the right of any style on our product pages. Simply click on this and you will be able to title your review, give a "star" rating and write your comments. Wear eligible boots for 30 days and if you aren’t completely satisfied that it is the most durable and comfortable you’ve ever worn, send it back for a full refund. Please contact our customer service team for additional details. HARLEY, HARLEY-DAVIDSON and the Bar & Shield Design are among the trademarks of H-D U.S.A., LLC ©2015 H-D and its Affiliates. All Rights Reserved. Wolverine World Wide, Inc. is a licensee of Harley-Davidson Motor Company. Wolverine World Wide, Inc. is a global marketer of branded footwear. 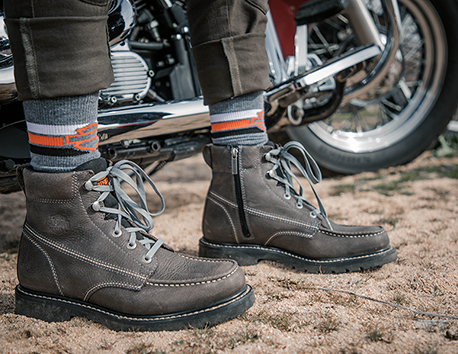 With an established global footprint that spans approximately 200 countries and territories, as well as a rock-solid infrastructure, Wolverine Worldwide is dedicated to advancing Harley-Davidson® Footwear.